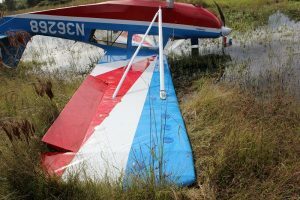 The pilot reported that, while landing on a private grass airstrip, in a crosswind, a gust from the right made the tailwheel-equipped airplane weathervane into the wind. He added that, while correcting for the crosswind, the airplane drifted left, and the left main landing gear sunk into soft ground. The airplane pivoted left, the right main landing gear exited the runway, and the airplane nosed over. The airplane sustained substantial damage to the right wing, right wing spar, and the left wing lift strut. The pilot reported that the wind was variable at 10 knots, gusting 15 knots.